Enets (enet'-enche) is the self-designation of this ethnic group the original meaning of which is 'a human being, a man'. In most cases the adjective enej - onaj (real, genuine) is added; i.e. enej enet or 'Enets, a real human being'. In a similar manner the Enets language is called onaj bazaan 'a real, genuine language'. The name Enets was first used by a linguist and ethnologist, G. Prokofiev, in 1937. It is a version of the pronunciation of nenets. An earlier and better known name for the Enets was the Enisei Samoyeds, derived from their habitat on the Enisei. This name is still widely used outside the Russia. The general name Samoyed was first used in a chronicle by Monk Nestor. It has been suggested that the word has its origins in the somatu or samatu, used by the Selkup to denote the Enets. Another theory has it as a non-Russian word of unknown origin. The Bai tribe on the Ob has been mentioned in another Russian chronicle (the 11th century). The Enets inhabit the east bank of the River Enisei in the western part of the Taimyr Peninsula. They belong to the Dudinka and Ust-Enisei Regions of the Taimyr Autonomous Territory in the Krasnoyarsky Krai. It is a polar permafrost area, mostly tundra and tundra mountains. The maximum temperature in summer is -13 �C and the average temperature in winter is -30 �C. The Tundra Enets move in an area between the Enisei and the Pyassina while the Wood Enets live to the north in the centre of the Dudinka territory, in wooded tundra. Anthropologically, the Enets belong to the Uralic race. Mongoloid and Arctic features are predominant, with only a minor European influence observable. They have broad faces, high cheekbones and slit eyes. Their hair and eyes are dark, and their skin is swarthy. The average height of the male Enets is less than 160 cm. They have no facial hair. The Enets language belongs to the northern group of the Samoyed languages, part of the Uralic family of languages. The Enets language is divided into two dialects, the vocabularies of which differ considerably. The dialects are spoken in two different Enets habitats: the Tundra Enets form a majority and speak bai or 'tundra' dialect, while the Wood Enets speak madu or 'wood' dialect. In addition to these there is also a small group known as the Karastin Enets (Mugadi and Yuchi tribes), who speak partly bai, partly madu. Their language has not been researched. The Enets generally prefer to call themselves by their tribal designations. In the Dudinka region, the Enets have lived side by side with the Nganasans and the Nenets, and in the Ust-Enisei district, alone with the Nenets. The languages have influenced each other. Words connected with hunting have been borrowed from the Nganasan language, and terms concerned with reindeer rearing have been taken from Nenets. The Enets language has also been influenced by the Dolgan, the Evenk and the Russian languages. Mixed marriages have played an important role in the linguistic processes of the Taimyr Peninsula. In former times the Enets married only with the Nganasans, their closest neighbours, but later marriages also took place with the Nenets, the Dolgans and the Evenks. In spite of the multilingualism of the area, the partners in mixed marriages tended to use the Nenets language, a lingua franca of the people in the area. Owing to the influence of ideology and culture, Russian started to spread rapidly in the 1930s. The growth of Enets as a language has been stunted by an excessive number of loans. It is quite common for people speaking Enets to switch over to Russian or to incorporate Russian words, sentences or phrases. When the unity of the Uralic languages disintegrated, the ancestors of the Samoyedic people separated from the Finno-Ugric tribes. At first they inhabited the areas west of the Urals, in the neighbourhood of the Finno-Ugric people, but later they moved to the east and northeast. The Enets come from the northern group of the Samoyedic people. They started to branch off in the second half of the first millennium. The Enets consider themselves to be the indigenous inhabitants of the Taimyr Peninsula. 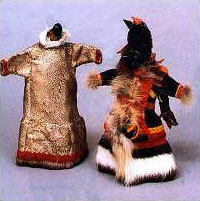 According to their legends, the Nenets arrived there later from the Yamal Peninsula. Together with the Nganasans they fought to prevent the Nenets from settling. Due to their marginal area of habitation, the Russians remained unaware of the Enets long after they knew of the Ob-Ugric people and even the Nenets. Although Christianization occurred in the 18th century it was very superficial, and shamanism and animism have survived until the present day. The main spheres of activity for the Enets have always been hunting and fishing. They have also been nomadic people, dependent on the rhythms of their environment. Before collectivization, they roamed the right bank of the River Enisei (the Nenets roamed the left bank). In summer they gathered food, firewood, and the material for their winter houses and clothes. Like the Nenets, they domesticated a number of reindeer and used them as draught animals. Under Soviet rule the life of the Enets changed considerably. During collectivization the process of transforming the Enets into a settled people began, and that turned their whole life upside down. They no longer had any right to reindeer and their pastures. In boarding schools, children became estranged from their native language, and had to re-learn speech in Russian. Since the 1960s the influx of immigrants has increased and large industrial enterprises have been built. A large gas company and its employees - migrants, road builders, lorry drivers, builders - are the masters in the land of the Enets. They are the representatives of industry and the Russian language. They are also transitory inhabitants uninterested in the environment, which they devastate, burn and pollute. They despise the native people.